Tucked among the backroads of Leesport, Pennsylvania, Berks County Residential Center exclusively hosts immigrant parents and children as they wait to learn their fate. It is one of three ICE facilities that hold families; the other two are in Texas. At an ICE family detention center in Pennsylvania, one 10-year-old girl’s medical records tell two different stories. The Berks County Residential Center’s contracted psychologist held several check-ins with the child and her mother while they were detained between December 2015 and May 2016. In his notes, the psychologist described a woman who could not discipline her daughter and a girl who threw tantrums when she didn’t get her way. He wrote that he "politely reminded" the mom that she could "set boundaries." As to the child's bedwetting, he suggested that she visit a urologist, just in case. But he wrote, "the impression she left on me and the interpreter was that her enuresis was related to nothing more than laziness." While at Berks, the girl's condition dramatically worsened. She visited an adult urologist during the last month of her stay and never saw a pediatrician. She was hospitalized in mid-March, 10 months after her release. She has potassium in her urine, and her doctors told her that her disease is incurable. A transplant would prove too difficult, and both her kidneys are failing. This 10-year-old girl was hospitalized because of severe of kidney issues in March, 10 months after her release from Berks. "Now, she has permanent damage," said Bridget Cambria, one of the pro-bono lawyers who represent detainees at Berks. 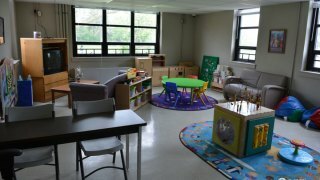 For 14 families, all without criminal records, life at Berks County Residential Center has become a long-term reality. In phone interviews, three current detainees told NBC they've grown tired of an education system that barely teaches, a medical unit that doesn't meet their needs, a cafeteria with inedible food, and a staff with no comprehension of their culture. But mostly, they're sick of lingering in limbo. She and her associates, who are based in Reading, Pennsylvania, connected NBC with the mothers, who spoke under the condition that they remain anonymous for fear of retaliation from U.S. Immigration and Customs Enforcement, the facility’s staff, and their abusers back home. The center is run by county employees and contractors who advocates say lack fundamental aptitudes for their jobs. The children at Berks could be better served in the open, where more qualified and diverse individuals would see to their needs. When the 10-year-old girl continually had nighttime accidents at Berks, not all medical professionals missed her warning signs. One of the lawyers brought in someone from the outside to re-assess her. Kathryn S. Miller, a registered clinical social worker and play therapist-supervisor, noticed how close the family was -- how when the mother began to cry, her daughter quickly handed her a tissue and later affectionately plucked a piece of lint from her shirt. Miller asked them why they had left El Salvador, and they told her about the gang activity that had forced them to run. They had often heard gunshots around their home, and their neighbors would be robbed or disappear. In Miller’s notes, she wrote that the girl said gang members would “do bad things, and that’s why I’m so scared.” One had broken into her house to hide from the police. When he was in her home, she had been afraid for her life and her loved ones. The psychologist declined comment to NBC on his work at Berks and directed contact through ICE, which has not granted an interview with him. 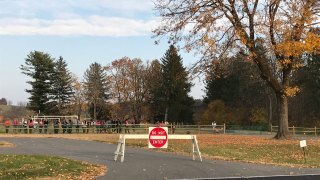 Tucked among the backroads of Leesport, Pennsylvania, Berks County Residential Center exclusively hosts immigrant parents and children as they wait to learn their fate. It is one of three ICE facilities that hold families; the other two are used for short-term detention in Texas. It’s hidden, and locals might be surprised to find out it’s even there. Berks is one of three ICE facilities that hold families; the other two are in Texas. At the two-floor center that holds up to 96 people, stark white walls surround detainees day and night in dorm-style rooms that, for some, become their home for years. “It’s such a creepy place,” said Karen Hoffmann, a legal advocate for immigrants at Berks. Beginning in November 2015, over two dozen immigrant families filed habeas corpus lawsuits that collectively comprise Castro v. Department of Homeland Security. Fourteen of the families are still at Berks. In the case, detainees who had failed their credible fear interviews for asylum decried the U.S. immigration system because of its lack of external review and asked for another chance to remain in the United States. The American Civil Liberties Union spearheaded the suit and has pushed it all the way to the Supreme Court. All of the families involved in Castro were detained after crossing the southern border. Their confidential interview and habeas documents indicate that they were primarily asked “yes” or “no” questions, sometimes not even in their native languages, and they were often cut off mid-sentence during the interview process, according to their attorneys. After they had failed their interviews, immigration judges rubber-stamped those decisions during five-minute hearings. All of the immigrants were assigned to expedited removal and put in detention while awaiting deportation. The asylum interviews took place under President Barack Obama's administration. Our former commander in chief cracked down on undocumented families after the 2014 immigration crisis, when women and children flocked to the United States seeking refuge from violence in El Salvador, Honduras, and Guatemala. Since taking office, President Donald Trump has revamped expedited removal to apply to undocumented residents who have lived in the United States for up to two years, a dramatic extension of the policy. In the early 2010s, a majority of asylum cases were granted, but numbers plunged after 2014. Last year, more than 56 percent of cases were denied, according to the Transactional Records Access Clearinghouse at Syracuse University. Given Trump’s platform, they may continue to drop. Both Obama and Trump said that undocumented criminals were their priority for deportation, but none of the immigrants in the Castro case have a criminal record, according to Hoffmann. The Third Circuit of the U.S. Court of Appeals in Philadelphia ruled against the immigrant families in August, refusing them the capacity to challenge their deportation. That decision meant that “enemy combatants in Guantanamo who are not even on U.S. soil have more rights than asylum seekers,” Kline said. “How can that be, that people that you say are terrorists, who are trying to blow up the United States, who haven’t even touched U.S. soil, have more rights to court procedure than a mom and child who are fleeing for their lives?” she asked. The Supreme Court is expected to decide if it will hear the case in mid- to late-April. If it does hear Castro, the detainees’ attorneys hope their clients will be set free until the scheduled court date, which could be set for years from now. If they win the case, they will be able to re-interview for asylum. But if the appeal is denied in the next few weeks, all of the families will most likely be deported. Since the lawsuit was filed almost a year and a half ago, ICE has maintained that everyone involved must remain in detention until a final ruling, according to the families’ attorneys. Still, about half have been released because of medical issues or outside pressure, upon the discretion of ICE officials. The rest wonder why their illnesses — diabetes, or their children’s ever-declining weight, or crippling depression — do not qualify them for discharge. While the families wait to learn the Supreme Court’s decision, their kids are growing up in confinement, and advocates say the center is not equipped for years-long stays. "ICE is committed to ensuring that residents at the Center are provided a safe, secure and humane environment as they go through the immigration process, which also includes those who remain at the Center for extended periods of time," officials said in a statement. In August, some of the mothers went on a hunger strike to demand their release, so fed up with the system that they were willing to forgo basic nutrition for weeks. Many of them are still at Berks. Amnesty International USA launched a campaign in March to free four children who all have Special Immigrant Juvenile Status and who have been in detention for over 500 days. One of the mothers in the Castro case is from Honduras and has a 3-year-old son. When they crossed the border, he was only 22 months old. After getting picked up and transferred from Karnes County Residential Center in Texas, they have spent 18 months at Berks while her parents and siblings wait for them on the outside. She said that the children aren’t allowed to run around, and that her son spends all his time by her side, always monitored and controlled. Staffers tell her that he should be seated, and that he has no need to run and explore, she said. The Berks Resident Handbook, which was included as evidence in a court case, says that children under 10 "are expected to be under the direct supervision of their parent at all times" unless there's an organized activity, or they're in school. Kids over 10 can get free movement passes, if their parents agree. ICE officials said in a statement to NBC that "similar to other child care facilities and schools" detainees are allowed to run in the center's recreational areas. School-aged children attend classes during the morning and early afternoon, for five hours each day, according to ICE. While they study, their moms wipe down almost the entire facility — the kitchen, lobby, phone areas, bathrooms, practically everything but the ICE offices. “Once you drop your kids off, out comes the cleaning cart and you start cleaning,” Cambria said. Though the work program is technically voluntary and pays one dollar a day, mothers take part because if they are assigned to the kitchen shift, they’re given juices and ice cream for their kids, who they say won’t eat most of the other food in the cafeteria because it's gross. Menus from May and June 2016 show that residents had access to rice, beans and tortillas, but main courses tended more toward carb-loaded American favorites like pizza, chicken tenders, and hot pockets. In class, three teachers and two assistants cover five subjects -- including physical education -- for all grade levels. In a statement to NBC, ICE wrote that "the curriculum is individualized for students based on their learning profiles and academic needs." In practice, kids are doled out worksheets or handed books for self-study. Some detainees and their representatives indicated that the education is inadequate. When Hoffmann, the legal advocate, visited an 11-year-old at Berks, the girl asked if they could watch “Barbie: Princess Charm School.” It was what they were doing in class, she said. Most kids "really want to go to school and really want to learn," said Kline, one of the attorneys. "And then here’s this school where they are doing worksheets and no one’s teaching them anything." Loulou, a young Syrian woman who was detained with her father for six months when she was 15 and 16 before being granted asylum, has deferred an offer of admission from Rutgers University, where she plans to study mathematics, to work for a year. She asked to use her nickname without her last name because members of her family are still waiting to come to the United States. Loulou said that while at Berks, she didn't feel discriminated against by her teachers, but she added, “I never learned anything new.” All of the assignments were “primary school level,” and her instructors struggled to teach her. They would give her a vocabulary list each day that she would have to define, “and that was basically it” for language arts, she said. A play area where families wait while they're being processed into Berks. Sometimes, when the English teacher taught her math, she would just read from a textbook. If she had any questions about a problem, she was told to skip it. Art projects are popular among the teachers. On the walls near the visitation area, crafty assignments for the season ask the children to describe where they hope to travel in the summer, or what they want for Christmas in December. For St. Patrick’s Day this year, the attorneys said the kids had to fill out prompts about why they were lucky. ”What they want to write is ‘I’m lucky because... I’m not. I’m stuck in this place, and I can’t leave,’” Cambria said. Some children ask their advocates for supplementary books. Before Donald Trump was elected, a 12-year-old boy requested a copy of "The Rise and Fall of the Third Reich" in Spanish, Hoffmann said. The kid's mother complained in Flores v. Holder, another case that involved Berks, that her son "gets bored" in class. Inn a June 2016 declaration, Joshua G. Reid, ICE assistant field office director in Philadelphia, responded by saying that the boy had been moved from the third- to sixth-grade classroom to a seventh- to tenth-grade level, where he appeared to be "challenged, yet doing well." One of the mothers from El Salvador has a 16-year-old son, and they’ve both been at Berks for 18 months. He was excited to come to the United States, where he could study English and take classes in all different subjects. “He says, ‘Mom, I want to leave here so I can learn more,’” she told NBC. Her son has slept next to her for a year and a half, through puberty. While other teenagers occasionally circle through Berks, he is usually the only boy his age. “He looks out the window and asks, ‘When will I get to leave through that door?’ And I can’t answer him because I don’t know,” she said. Now, he has gotten so depressed that he skips lunch and takes a nap between classes. He doesn’t like the cafeteria food, and like many of the other kids, he longs for dishes that reflect the cuisine from his country. Another mother from El Salvador, who has a 7-year-old son, said that adolescents often get desperate, grabbing ropes and threatening to hang themselves, or wishing they would die. “It’s not just, that kids spend their childhoods locked in four walls,” she said. The counselors, childcare professionals who watch over detainees, are supposed to look out for their well being. But, according to the attorneys and some immigrant mothers, they lack essential qualifications, like Spanish fluency and cultural understanding, and their misconceptions can sometimes turn into racism. One counselor often talked about his support for Trump during the campaign, according to an internal declaration that a former detainee filed against him. When the woman asked him to stop saying that Trump “will make sure all immigrants get out of this country,” he “started picking the hairs out of his beard and throwing them at me,” she wrote in the complaint, which was sent directly to the facility's executive director, Diane Edwards. That same Saturday, he approached her daughter and two other children. “He asked the girls to let their hair down and to start dancing” to hard rock, she wrote, and whoever danced the best would be rewarded with candy. The complaint was filed in November, and attorneys were told that there would be an investigation. When they followed up in January, they did not receive a response. In a separate ChildLine report, a 6-year-old boy told Miller, the Pennsylvania social worker, that he had witnessed the same counselor refuse to help a 16-year-old detainee carry a 13-year-old, who had collapsed from lack of oxygen, to the medical center. ChildLine is the Pennsylvania Department of Human Services' (PDHS) child protective services program that sorts tips and sends them to a relevant investigative body. NBC asked to speak to the counselor, who as of March still worked at Berks, but ICE has yet to grant the request. Officials would not confirm whether he is still employed by them, or whether they have ever looked into his behavior. ICE said in a statement that they "are committed to ensuring that residents at the Center are treated in a safe, secure and humane manner" and "allegations of possible misconduct are thoroughly reviewed and investigated." The mothers also criticized the staff’s routine bed checks, which take place every 15 minutes in compliance with the facility’s agreement with PDHS. According to Reid's declaration for Flores v. Holder, last summer his team was in negotiations with PDHS to change the frequency of bed checks to once per hour. ICE declined to discuss "matters of pending litigation" with NBC and the detainees say the policy has yet to be revised. Because of the constant nighttime intrusions, they’re always exhausted. In January, during a room check in the early morning, one detainee saw a staff member approach her daughter's bed. The move triggered her PTSD, and she screamed four or five times out of fear that her child would be attacked. When she visited the Berks psychologist, he wrote in his notes that "she acknowledged that she loudly screamed repeatedly, and indicated that she was 'ashamed' of her behavior." Some mothers worry that they’re failing their children. When the mom from Honduras’ infant was shaking with a high fever, she tried to go to the medical wing to get him help (detainees aren’t allowed to keep most medication, including aspirin, in their rooms). She was told to return in the morning, but when she showed up before 7 a.m., the medical staff said they couldn’t see her son until 4 p.m., during walk-in hours. 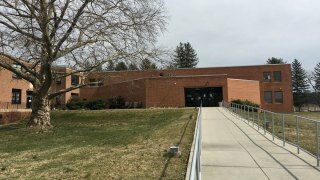 ICE officials confirmed that Berks holds walk-in hours from 9-10 a.m. and 4-5 p.m. daily but disputed mothers' allegations that they didn't have true access to around the clock care. They said that residents with urgent needs "will receive treatment at the medical clinic 24 hours a day, 7 days a week." Cambria said that the only thing the Berks moms care about is their children. Many of the mothers have refused deportation because they fear their children will be hurt or killed if they return home. They’re willing to endure a drawn out court process even if it means staying indefinitely in detention, putting their lives on pause. “I want to keep fighting, for my son,” one said.